All of the styles are based on the same look from the front, as on this mannequin. The fabric is sewn in a double layer to create a seamless style and a smooth, comfortable fit. Our bikini tops are a tradition seamless triangle style. A comfortable design that offers more support than most swimwear brands of a similar style. 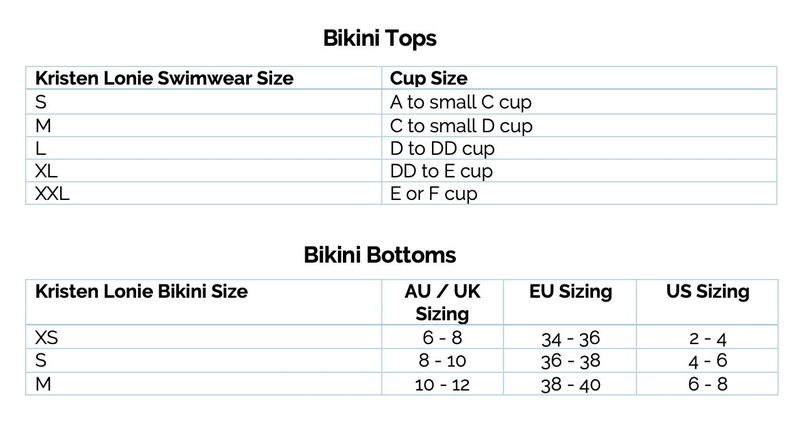 The tops do not provide full coverage; if you prefer full coverage then you may want to go up one size. At the back, we specialise in three bikini styles. They are shown here on a mannequin with smaller glutes; so if you have larger glutes, the bikini may look more brief. None of our bikinis provide full coverage – they are designed to show off your buns! 1. The Cheeky-G style is our great for tanning. It is a thong style with no rouching. A great addition to your summer wardrobe. 2. Our famous Micro Brazilian with the scrunch bum is more brief at the back of the pant than the brief Brazilian. This style looks great regardless if your glutes are big or small. The micro Brazilian cut even makes the mannequins buns look good! 3. The Brief Brazilian is a cheeky style with a scrunch bum & tie sides This style offers just a little more coverage than the Micro Brazilian. Please note our bikinis dont have full coverage, all styles designed to show off your buns. The biggest compliment we receive is from girls is that they love the high quality of our fabrics and finishes & they are a comfortable design that ‘fit like a glove. You will want to live in them all summer long!!!! !